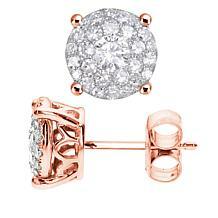 Attention, glamorous ladies: HSN sells dazzling Diamond Couture stud earrings. 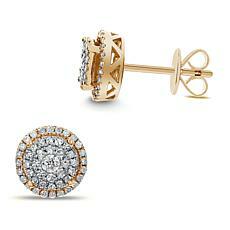 Admire this gorgeous collection in the classic combination of a girl's two best friends, diamonds and 14-karat gold. Diamond Couture prizes quality in its materials and artistry: All diamonds are rhodium- plated and graded with a Certificate of Authenticity. 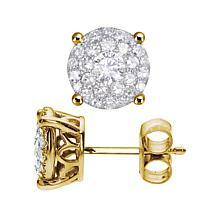 An earring may have up to 40 or 50 individual diamonds, seamlessly pieced together. All you see is diamonds! The halo earrings capture beams of light coming from numerous directions and shine every way you turn. Or, you might be entranced by earrings with a tiered look, like a glittering cake, with delicate metalwork detailing on the tiers. The backs are sturdy French pushbacks with elegant curves to ensure you don't have to worry about losing one. While all of the earrings are 14-karat gold, you can customize your look through yellow gold, white gold, or rose gold. Buying Diamond Couture stud earrings through HSN is an amazing deal, with prices much lower than the appraised value. 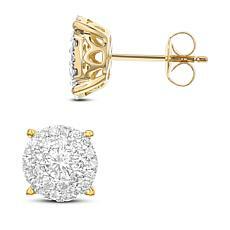 These beautiful diamond and gold earrings have a timeless look and will last for your lifetime and beyond. 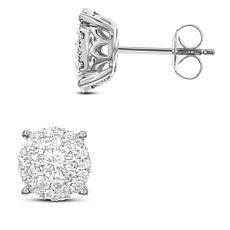 Purchase a Diamond Couture necklace and also a Diamond Couture ring for an extraordinary gift for a special woman.